This entry was posted in ADF, Afghanistan, Special Forces by N.R. Jenzen-Jones. Bookmark the permalink. “Unfortunately for Australian designers and producers, MultiCam has a noted track record and enjoys a high-level of support from the troops” … And of course there is absolutely no way in which the technology of personal concealment could have progressed, since 2003. There have been lots of recent developments, but MultiCam is popular with special operations personnel, which has made it very appealing. There don’t seem to be many Australian options, and those there are haven’t made successful proposals. Basically, it should be a case of what works best to conceal and protect the troops. If local contractors can come up with superior alternatives (after testing them objectively) then this alternatives can be used. Until then, why not go with what has proven to be effective? Since there is no one size fits all for camo, you might in reality very well need more than one set. Just sayin’. There are not a lot of options perhaps, but at least one, and I have’t heard him mentioned here yet. I read an article by Brad Turner, Australian camoufleur, on his site (http://www.roggenwolf.com/) which expresses his outrage at the DMO for jumping to their conclusions, effectively. And he has a good point. For $4.7mil, the DMO could have launched their own Army Camouflage Improvement Effort, or hired local scientists to design their own camouflage to be just as effective. Or any number of more local and possibly cheaper options. The concerning fact is that they didn’t even consider doing so. Instead of a decisively new, more effective camouflage pattern, Australian troops are gettting a foreign rehash of an old, ineffective pattern. Just bloody buy MultiCam – don’t waste millions of dollars to “reinvent the wheel” – what a waste of money. if MultCam works then don’t FIX it – Hearts & Bunnies supposedly works (despite how ugly it is) but if MultiCam is better then the Australian Military should just BUY MULTICAM – as is. There are too many different camos as there are right now: count them: Woodland (still used remember!) and all it’s “different variants”, British DPM (and all it’s Commonwealth country variants), Flecktarn, digital camos like CADPAT / MARPAT and the variations in the Middle East, South America and South East Asia, and of course total rubbish UCP. “Developing” a new camo is like trying to figure out how to drink water differently. If CRYE nailed it – then GO WITH IT. What a load of crap!!!!! DFD – I agree, we should definitely try not to roll everything into one ‘universal’ camo design. But for units being deployed on expeditionary operations to unknown theatres, it pays to have something like MultiCam, or an equivalent. Kevin – Are you saying we should issue MultiCam to troops stationed here in Australia without conducting extensive testing here? I’m the first to admit MultiCam has proven very valuable in certain regions (notably AFG), but surely we should conduct some sort of evaluation here? It would be worth testing how Multicam in Australia to see how it compares to other patterns. While we are at it, can we make the testing publicly available?! Firstly, I am all for supprting australian industry. Let’s support the manufacturing industry whenever we can, but not at the expence of our troops. When it comes to combat uniforms, we haven’t produced a decent thing since DPCU’s were introduced (apart from the trail cams). Aussie manufacturers have had their chance over the last 30 years to produce a decent product. Fail, fail, fail. Get Crye Multicam, off of the shelf, as is. No alterations! Let’s not reinvent the wheel Australia. Uniforms manufactured to US Mil Spec are awesome quality, which cannot be denied. Having had to suffer various domestically manufactured uniforms over the years, can’t we just admit, that australian manufactured stuff obviously made by the lowest bidder and crap. Don’t even get me started on our boots. You do get what you pay for. 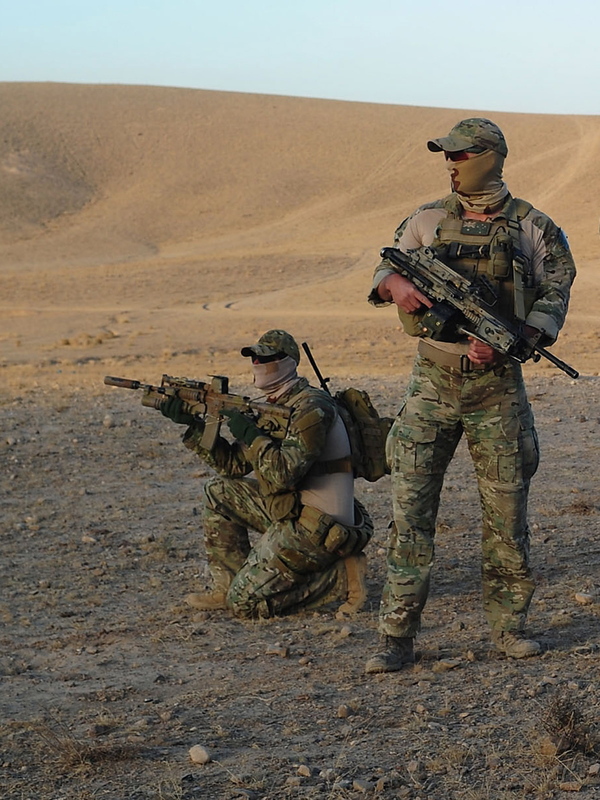 Why aren’t we already be trailling Multicam for Australian environments due to it’s popularity with the actual war-fighters. Unfortunatly, it is not the soldier who makes the decision on his equipment (unfortunatly). Our uniforms are cheap crap. I make no apologies, but it’s not you wearing it. MCS – I’ve contacted Brad at Roggenwolf, and had a lot of trouble getting any information out of him. However, stay tuned as I’m hoping to bring some more information to the ‘camouflage for Australia’ debate in the future. Also, calling MultiCam “old” and “ineffective” is a bit disingenuous; DPCU was trialled through the late 70s and early 80s. MultiCam is still one of the ‘newest’ patterns, in modern camouflage terms, on the market. Also, extensive field testing (refer to UK testing as cited above, and US Army [Natick] testing from June 2009) has shown MultiCam to be one of the most effective multiple-terrain patterns. In other words, marketing aside, it pretty much ‘does what it says on the label’. I’m not saying that makes it the best (unmodified) choice, particularly not if it is to be issued to troops stationed in Australia, but calling it “ineffective” is just plain wrong. The Medic – My comment to ‘MCS’ above tangentially addresses one of the points I’d raise with you; that is, MultiCam is great for a lot of things (AFG, and other areas with rapid desert to ‘green zone’ transitions, in particular), but it isn’t a panacea. I think we owe it to troops stationed here in AUS to determine how effective it is in our own backyard. Also, given the regularity with which we play peacekeeper in our neighbourhood (Timor, Fiji, The Solomons etc), I would think testing in tropical and subtropical conditions would be warranted as well. As for the quality of the gear, everyone seems happier with the new ‘Crye-style’ uniform designs, so I hope they are here to stay. Australian manufacturers have been taking cues from these for years now, so with any luck the government will look at some of their products too. DPCU is a old uniform, although it suits Australia well, it is not the best for some areas in Afghanistan. In my opinion, the ADF should adapt a new ”Aussie” version because it shows that we are capable of progressing out of the 20th century, but at the end of the day, it is about saving lives of soldiers, not a giant military fashion markets reputation even if it does impact on Australian markets.